Chris called me about replacing a stained glass window in his New Orleans home that had been damaged in Hurricane Katrina. He explained his home is in the Fairgrounds area which serves as the site of the city's horse racetrack and the Jazz Festival. He described his house as a "traditional shotgun double" built about 1915. He explained the "shotgun" term means that the rooms on each side of the house are arranged in a straight line, one behind the other, from the front door to the back. 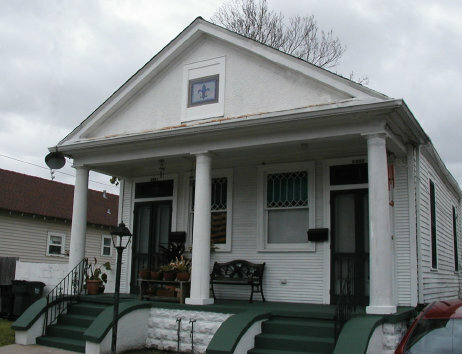 Although built 4 feet above the ground, the house still took on another 3 feet of water inside during Hurricane Katrina. Fortunately the house was saved and beautifully restored. Chris spotted a fleur-de-is window that I built in 2002 on my website, that was then enjoying its home in my kitchen window. Even though I offered to build him a custom window, he told me he wanted this window, exactly as it is .... and he would make it fit perfectly where the original window had been. He installed a clear protective window as a barrier against the elements and then installed the stained glass window on the inside. 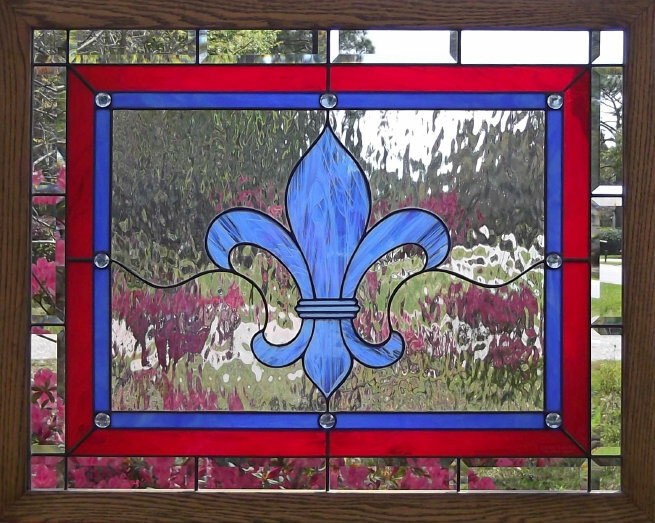 My wife is a fleur-de-lis fan, so over the years I have built a number of fleur-de-lis stained glass pieces, but this one is unique. It has a beveled border and irridized waterglass background. The irridized glass has a very faint multicolored sheen on it like a thin film of oil on water. Waterglass is the perfect glass to let light in and still afford good privacy. This window contains 57 pieces of glass, measures about 24 1/4 " x 30 1/4 " and was framed in a 1 x 2 red oak frame. Chris installed his new window in February, 2016 and did an amazing installation job ......looks like it is original to the house. 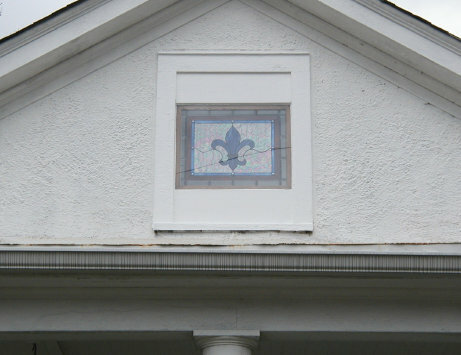 The City of New Orleans can now boast another Fleur-de-lis to signify its proud heritage!